Founded in Switzerland in 1872, Zurich Insurance Group has evolved from a large Swiss insurer into one of the world’s leading insurance groups, providing insurance in more than 170 countries. Among its products, Zurich Insurance Group provides insurance for companies and individuals using the roads as part of their core activities. The company incorporates initiatives to achieve road safety among those road users as part of its corporate social responsibility (CSR) strategy. Leading by example, the company is a keen proponent of fleet safety, championing commitment from organizations towards the creation of a ‘crash free culture’ where road safety is recognized as business as usual. Zurich Insurance Group has made sensitizing young adults to the dangers of road traffic a CSR priority. 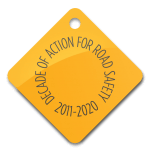 The company seeks to address the safety of young people, statistically at higher risk of injury or fatality on the roads, by promoting measures that contribute to accident prevention and greater road safety, with a particular focus on speeding and alcohol. Driving is a privilege that is often taken advantage of. In business, you not only have to be concerned for your employed drivers, but other drivers on the road. Make sure your employees are aware of all the distractions that may arise.